"Big Freeze" redirects here. For other uses, see Big Freeze (disambiguation). Observations suggest that the expansion of the universe will continue forever. If so, then a popular theory is that the universe will cool as it expands, eventually becoming too cold to sustain life. For this reason, this future scenario once popularly called "heat death" is now known as the Big Chill or Big Freeze. If dark energy—represented by the cosmological constant, a constant energy density filling space homogeneously, or scalar fields, such as quintessence or moduli, dynamic quantities whose energy density can vary in time and space—accelerates the expansion of the universe, then the space between clusters of galaxies will grow at an increasing rate. Redshift will stretch ancient, incoming photons (even gamma rays) to undetectably long wavelengths and low energies. Stars are expected to form normally for 1012 to 1014 (1–100 trillion) years, but eventually the supply of gas needed for star formation will be exhausted. As existing stars run out of fuel and cease to shine, the universe will slowly and inexorably grow darker. According to theories that predict proton decay, the stellar remnants left behind will disappear, leaving behind only black holes, which themselves eventually disappear as they emit Hawking radiation. Ultimately, if the universe reaches a state in which the temperature approaches a uniform value, no further work will be possible, resulting in a final heat death of the universe. Infinite expansion does not determine the overall spatial curvature of the universe. It can be open (with negative spatial curvature), flat, or closed (positive spatial curvature), although if it is closed, sufficient dark energy must be present to counteract the gravitational forces or else the universe will end in a Big Crunch. Observations of the cosmic background radiation by the Wilkinson Microwave Anisotropy Probe and the Planck mission suggest that the universe is spatially flat and has a significant amount of dark energy. In this case, the universe should continue to expand at an accelerating rate. The acceleration of the universe's expansion has also been confirmed by observations of distant supernovae. If, as in the concordance model of physical cosmology (Lambda-cold dark matter or ΛCDM), dark energy is in the form of a cosmological constant, the expansion will eventually become exponential, with the size of the universe doubling at a constant rate. If the theory of inflation is true, the universe went through an episode dominated by a different form of dark energy in the first moments of the Big Bang; but inflation ended, indicating an equation of state much more complicated than those assumed so far for present-day dark energy. It is possible that the dark energy equation of state could change again resulting in an event that would have consequences which are extremely difficult to parametrize or predict. In the 1970s, the future of an expanding universe was studied by the astrophysicist Jamal Islam and the physicist Freeman Dyson. Then, in their 1999 book The Five Ages of the Universe, the astrophysicists Fred Adams and Gregory Laughlin divided the past and future history of an expanding universe into five eras. The first, the Primordial Era, is the time in the past just after the Big Bang when stars had not yet formed. The second, the Stelliferous Era, includes the present day and all of the stars and galaxies now seen. It is the time during which stars form from collapsing clouds of gas. In the subsequent Degenerate Era, the stars will have burnt out, leaving all stellar-mass objects as stellar remnants—white dwarfs, neutron stars, and black holes. In the Black Hole Era, white dwarfs, neutron stars, and other smaller astronomical objects have been destroyed by proton decay, leaving only black holes. Finally, in the Dark Era, even black holes have disappeared, leaving only a dilute gas of photons and leptons. This future history and the timeline below assume the continued expansion of the universe. If space in the universe begins to contract, subsequent events in the timeline may not occur because the Big Crunch, the collapse of the universe into a hot, dense state similar to that after the Big Bang, will supervene. For the past, including the Primordial Era, see Chronology of the universe. The observable universe is currently 1.38×1010 (13.8 billion) years old. This time is in the Stelliferous Era. About 155 million years after the Big Bang, the first star formed. Since then, stars have formed by the collapse of small, dense core regions in large, cold molecular clouds of hydrogen gas. At first, this produces a protostar, which is hot and bright because of energy generated by gravitational contraction. After the protostar contracts for a while, its center will become hot enough to fuse hydrogen and its lifetime as a star will properly begin. Stars of very low mass will eventually exhaust all their fusible hydrogen and then become helium white dwarfs. Stars of low to medium mass, such as our own sun, will expel some of their mass as a planetary nebula and eventually become white dwarfs; more massive stars will explode in a core-collapse supernova, leaving behind neutron stars or black holes. In any case, although some of the star's matter may be returned to the interstellar medium, a degenerate remnant will be left behind whose mass is not returned to the interstellar medium. Therefore, the supply of gas available for star formation is steadily being exhausted. The Andromeda Galaxy is currently approximately 2.5 million light years away from our galaxy, the Milky Way Galaxy, and they are moving towards each other at approximately 300 kilometers (186 miles) per second. Approximately five billion years from now, or 19 billion years after the Big Bang, the Milky Way and the Andromeda Galaxy will collide with one another and merge into one large galaxy based on current evidence. Up until 2012, there was no way to know whether the possible collision was definitely going to happen or not. In 2012, researchers came to the conclusion that the collision is definite after using the Hubble Space Telescope between 2002 and 2010 to track the motion of Andromeda. This results in the formation of Milkomeda (also known as Milkdromeda). The galaxies in the Local Group, the cluster of galaxies which includes the Milky Way and the Andromeda Galaxy, are gravitationally bound to each other. It is expected that between 1011 (100 billion) and 1012 (1 trillion) years from now, their orbits will decay and the entire Local Group will merge into one large galaxy. Assuming that dark energy continues to make the universe expand at an accelerating rate, in about 150 billion years all galaxies outside the Local Supercluster will pass behind the cosmological horizon. It will then be impossible for events in the Local Group to affect other galaxies. Similarly it will be impossible for events after 150 billion years, as seen by observers in distant galaxies, to affect events in the Local Group. However, an observer in the Local Supercluster will continue to see distant galaxies, but events they observe will become exponentially more red shifted as the galaxy approaches the horizon until time in the distant galaxy seems to stop. The observer in the Local Supercluster never observes events after 150 billion years in their local time, and eventually all light and background radiation lying outside the local supercluster will appear to blink out as light becomes so redshifted that its wavelength has become longer than the physical diameter of the horizon. Technically, it will take an infinitely long time for all causal interaction between our local supercluster and this light; however, due to the redshifting explained above, the light will not necessarily be observed for an infinite amount of time, and after 150 billion years, no new causal interaction will be observed. Therefore, after 150 billion years intergalactic transportation and communication beyond the Local Supercluster becomes causally impossible. 8×1011 (800 billion) years from now, the luminosities of the different galaxies, approximately similar until then to the current ones thanks to the increasing luminosity of the remaining stars as they age, will start to decrease, as the less massive red dwarf stars begin to die as black dwarfs. 2×1012 (2 trillion) years from now, all galaxies outside the Local Supercluster will be red-shifted to such an extent that even gamma rays they emit will have wavelengths longer than the size of the observable universe of the time. Therefore, these galaxies will no longer be detectable in any way. By 1014 (100 trillion) years from now, star formation will end, leaving all stellar objects in the form of degenerate remnants. If protons do not decay, stellar-mass objects will disappear more slowly, making this era last longer. By 1014 (100 trillion) years from now, star formation will end. This period, known as the Degenerate Era, will last until the degenerate remnants finally decay. The least massive stars take the longest to exhaust their hydrogen fuel (see stellar evolution). Thus, the longest living stars in the universe are low-mass red dwarfs, with a mass of about 0.08 solar masses (M☉), which have a lifetime of order 1013 (10 trillion) years. Coincidentally, this is comparable to the length of time over which star formation takes place. Once star formation ends and the least massive red dwarfs exhaust their fuel, nuclear fusion will cease. The low-mass red dwarfs will cool and become black dwarfs. The only objects remaining with more than planetary mass will be brown dwarfs, with mass less than 0.08 M☉, and degenerate remnants; white dwarfs, produced by stars with initial masses between about 0.08 and 8 solar masses; and neutron stars and black holes, produced by stars with initial masses over 8 M☉. Most of the mass of this collection, approximately 90%, will be in the form of white dwarfs. In the absence of any energy source, all of these formerly luminous bodies will cool and become faint. The universe will become extremely dark after the last star burns out. Even so, there can still be occasional light in the universe. One of the ways the universe can be illuminated is if two carbon–oxygen white dwarfs with a combined mass of more than the Chandrasekhar limit of about 1.4 solar masses happen to merge. The resulting object will then undergo runaway thermonuclear fusion, producing a Type Ia supernova and dispelling the darkness of the Degenerate Era for a few weeks. If the combined mass is not above the Chandrasekhar limit but is larger than the minimum mass to fuse carbon (about 0.9 M☉), a carbon star could be produced, with a lifetime of around 106 (1 million) years. Also, if two helium white dwarfs with a combined mass of at least 0.3 M☉ collide, a helium star may be produced, with a lifetime of a few hundred million years. Finally brown dwarfs can form new stars colliding with each other to form a red dwarf star, that can survive for 1013 (10 trillion) years, or accreting gas at very slow rates from the remaining interstellar medium until they have enough mass to start hydrogen burning as red dwarfs too. This process, at least on white dwarfs, could induce Type Ia supernovae too. Over time, the orbits of planets will decay due to gravitational radiation, or planets will be ejected from their local systems by gravitational perturbations caused by encounters with another stellar remnant. Over time, objects in a galaxy exchange kinetic energy in a process called dynamical relaxation, making their velocity distribution approach the Maxwell–Boltzmann distribution. Dynamical relaxation can proceed either by close encounters of two stars or by less violent but more frequent distant encounters. In the case of a close encounter, two brown dwarfs or stellar remnants will pass close to each other. When this happens, the trajectories of the objects involved in the close encounter change slightly, in such a way that their kinetic energies are more nearly equal than before. After a large number of encounters, then, lighter objects tend to gain speed while the heavier objects lose it. Because of dynamical relaxation, some objects will gain enough energy to reach galactic escape velocity and depart the galaxy, leaving behind a smaller, denser galaxy. Since encounters are more frequent in the denser galaxy, the process then accelerates. The end result is that most objects (90% to 99%) are ejected from the galaxy, leaving a small fraction (maybe 1% to 10%) which fall into the central supermassive black hole. It has been suggested that the matter of the fallen remnants will form an accretion disk around it that will create a quasar, as long as enough matter is present there. The subsequent evolution of the universe depends on the possibility and rate of proton decay. Experimental evidence shows that if the proton is unstable, it has a half-life of at least 1034 years. Some of the Grand Unified theories (GUTs) predict long-term proton instability between 1031 and 1036 years, with the upper bound on standard (non-supersymmetry) proton decay at 1.4×1036 years and an overall upper limit maximum for any proton decay (including supersymmetry models) at 6×1039 years. Recent research showing proton lifetime (if unstable) at or exceeding 1034–1035 year range rules out simpler GUTs and most non-supersymmetry models. Neutrons bound into nuclei are also expected to decay with a half-life comparable to that of protons. Planets (substellar objects) would decay in a simple cascade process from heavier elements to pure hydrogen while radiating energy. In the event that the proton does not decay at all, stellar objects would still disappear, but more slowly. See Future without proton decay below. Shorter or longer proton half-lives will accelerate or decelerate the process. This means that after 1037 years (the maximum proton half-life used by Adams & Laughlin (1997)), one-half of all baryonic matter will have been converted into gamma ray photons and leptons through proton decay. Given our assumed half-life of the proton, nucleons (protons and bound neutrons) will have undergone roughly 1,000 half-lives by the time the universe is 1040 years old. To put this into perspective, there are an estimated 1080 protons currently in the universe. This means that the number of nucleons will be slashed in half 1,000 times by the time the universe is 1040 years old. Hence, there will be roughly 0.51,000 (approximately 10−301) as many nucleons remaining as there are today; that is, zero nucleons remaining in the universe at the end of the Degenerate Age. Effectively, all baryonic matter will have been changed into photons and leptons. Some models predict the formation of stable positronium atoms with a greater diameter than the observable universe's current diameter in 1085 years, and that these will in turn decay to gamma radiation in 10141 years. The supermassive black holes are all that remain of galaxies once all protons decay, but even these giants are not immortal. In the event that the proton does not decay according to the theories described above, the Degenerate Era will last longer, and will overlap or surpass the Black Hole Era. However, degenerate stellar objects can still experience proton decay, for example via processes involving the Adler–Bell–Jackiw anomaly, virtual black holes, or higher-dimension supersymmetry possibly with a half-life of under 10200 years. The photon is now the last remnant of the universe as the last of the supermassive black holes evaporates. After 1040 years, black holes will dominate the universe. They will slowly evaporate via Hawking radiation. A black hole with a mass of around 1 M☉ will vanish in around 2×1066 years. As the lifetime of a black hole is proportional to the cube of its mass, more massive black holes take longer to decay. A supermassive black hole with a mass of 1011 (100 billion) M☉ will evaporate in around 2×10100 years. The largest black holes in the universe are predicted to continue to grow. Larger black holes of up to 1014 (100 trillion) M☉ may form during the collapse of superclusters of galaxies. Even these would evaporate over a timescale of up to 10106 years. Hawking radiation has a thermal spectrum. During most of a black hole's lifetime, the radiation has a low temperature and is mainly in the form of massless particles such as photons and hypothetical gravitons. As the black hole's mass decreases, its temperature increases, becoming comparable to the Sun's by the time the black hole mass has decreased to 1019 kilograms. The hole then provides a temporary source of light during the general darkness of the Black Hole Era. During the last stages of its evaporation, a black hole will emit not only massless particles, but also heavier particles, such as electrons, positrons, protons, and antiprotons. After all the black holes have evaporated (and after all the ordinary matter made of protons has disintegrated, if protons are unstable), the universe will be nearly empty. Photons, neutrinos, electrons, and positrons will fly from place to place, hardly ever encountering each other. Gravitationally, the universe will be dominated by dark matter, electrons, and positrons (not protons). By this era, with only very diffuse matter remaining, activity in the universe will have tailed off dramatically (compared with previous eras), with very low energy levels and very large time scales. Electrons and positrons drifting through space will encounter one another and occasionally form positronium atoms. These structures are unstable, however, and their constituent particles must eventually annihilate. Other low-level annihilation events will also take place, albeit very slowly. The universe now reaches an extremely low-energy state. What happens beyond 102500 years is speculative. It is possible that a Big Rip event may occur far off into the future. This singularity would take place at a finite scale factor. If the current vacuum state is a false vacuum, the vacuum may decay into a lower-energy state. Presumably, extreme low-energy states imply that localized quantum events become major macroscopic phenomena rather than negligible microscopic events because the smallest perturbations make the biggest difference in this era, so there is no telling what may happen to space or time. It is perceived that the laws of "macro-physics" will break down, and the laws of quantum physics will prevail. The universe could possibly avoid eternal heat death through random quantum tunnelling and quantum fluctuations, given the non-zero probability of producing a new Big Bang in roughly 10101056 years. Over an infinite time there could be a spontaneous entropy decrease, by a Poincaré recurrence or through thermal fluctuations (see also fluctuation theorem). The possibilities above are based on a simple form of dark energy. But the physics of dark energy are still a very active area of research, and the actual form of dark energy could be much more complex. For example, during inflation dark energy affected the universe very differently than it does today, so it is possible that dark energy could trigger another inflationary period in the future. Until dark energy is better understood its possible effects are extremely difficult to predict or parametrize. If the protons do not decay, stellar-mass objects will still become black holes, but more slowly. The following timeline assumes that proton decay does not take place. In an expanding universe with decreasing density and nonzero cosmological constant, matter density would reach zero, resulting in all matter including stellar objects and planets ionizing and dissipating at thermal equilibrium. Although protons are stable in standard model physics, a quantum anomaly may exist on the electroweak level, which can cause groups of baryons (protons and neutrons) to annihilate into antileptons via the sphaleron transition. Such baryon/lepton violations have a number of 3 and can only occur in multiples or groups of three baryons, which can restrict or prohibit such events. No experimental evidence of sphalerons has yet been observed at low energy levels, though they are believed to occur regularly at high energies and temperatures. In 101500 years, cold fusion occurring via quantum tunnelling should make the light nuclei in ordinary matter fuse into iron-56 nuclei (see isotopes of iron). Fission and alpha particle emission should make heavy nuclei also decay to iron, leaving stellar-mass objects as cold spheres of iron, called iron stars. 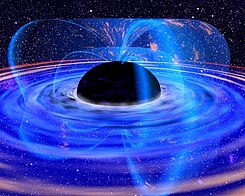 Quantum tunnelling should also turn large objects into black holes. Depending on the assumptions made, the time this takes to happen can be calculated as from 101026 years to 101076 years. Quantum tunnelling may also make iron stars collapse into neutron stars in around 101076 years. Graphical timeline from Big Bang to Heat Death. This timeline uses the double-logarithmic scale for comparison with the graphical timeline included in this article. Graphical timeline of the universe. This timeline uses the more intuitive linear time, for comparison with this article. The Last Question – A short story by Isaac Asimov which considers the inevitable oncome of heat death in the universe and how it may be reversed. ^ WMAP – Fate of the Universe, WMAP's Universe, NASA. Accessed online July 17, 2008. ^ Sean Carroll (2001). "The cosmological constant". Living Reviews in Relativity. 4 (1): 1. arXiv:astro-ph/0004075. Bibcode:2001LRR.....4....1C. doi:10.12942/lrr-2001-1. PMC 5256042. PMID 28179856. Archived from the original on 2006-10-13. Retrieved 2006-09-28. ^ a b c Krauss, Lawrence M.; Starkman, Glenn D. (2000). "Life, the Universe, and Nothing: Life and Death in an Ever-expanding Universe". Astrophysical Journal. 531 (1): 22–30. arXiv:astro-ph/9902189. Bibcode:2000ApJ...531...22K. doi:10.1086/308434. ^ a b c d e f g h Adams, Fred C.; Laughlin, Gregory (1997). "A dying universe: the long-term fate and evolution of astrophysical objects". Reviews of Modern Physics. 69 (2): 337–372. arXiv:astro-ph/9701131. Bibcode:1997RvMP...69..337A. doi:10.1103/RevModPhys.69.337. ^ a b c Adams & Laughlin (1997), §IIE. ^ Adams & Laughlin (1997), §IV. ^ a b Chapter 7, Calibrating the Cosmos, Frank Levin, New York: Springer, 2006, ISBN 0-387-30778-8. ^ Five-Year Wilkinson Microwave Anisotropy Probe (WMAP) Observations: Data Processing, Sky Maps, and Basic Results, G. Hinshaw et al., The Astrophysical Journal Supplement Series (2008), submitted, arXiv:0803.0732, Bibcode: 2008arXiv0803.0732H. ^ a b c Dyson, Freeman J. (1979). "Time without end: Physics and biology in an open universe". Reviews of Modern Physics. 51 (3): 447–460. Bibcode:1979RvMP...51..447D. doi:10.1103/RevModPhys.51.447. ^ a b c d e f g h The Five Ages of the Universe, Fred Adams and Greg Laughlin, New York: The Free Press, 1999, ISBN 0-684-85422-8. ^ Planck collaboration (2013). "Planck 2013 results. XVI. Cosmological parameters". Astronomy & Astrophysics. 571: A16. arXiv:1303.5076. Bibcode:2014A&A...571A..16P. doi:10.1051/0004-6361/201321591. ^ a b Laughlin, Gregory; Bodenheimer, Peter; Adams, Fred C. (1997). "The End of the Main Sequence". The Astrophysical Journal. 482 (1): 420–432. Bibcode:1997ApJ...482..420L. doi:10.1086/304125. ^ Heger, A.; Fryer, C. L.; Woosley, S. E.; Langer, N.; Hartmann, D. H. (2003). "How Massive Single Stars End Their Life". Astrophysical Journal. 591 (1): 288–300. arXiv:astro-ph/0212469. Bibcode:2003ApJ...591..288H. doi:10.1086/375341. ^ van der Marel, G.; et al. (2012). "The M31 Velocity Vector. III. Future Milky Way M31-M33 Orbital Evolution, Merging, and Fate of the Sun". The Astrophysical Journal. 753 (1): 9. arXiv:1205.6865. Bibcode:2012ApJ...753....9V. doi:10.1088/0004-637X/753/1/9. ^ Cowen, R. (31 May 2012). "Andromeda on collision course with the Milky Way". Nature. doi:10.1038/nature.2012.10765. ^ Adams, F. C.; Graves, G. J. M.; Laughlin, G. (December 2004). García-Segura, G.; Tenorio-Tagle, G.; Franco, J.; Yorke, H. W. (eds.). "Gravitational Collapse: From Massive Stars to Planets. / First Astrophysics meeting of the Observatorio Astronomico Nacional. / A meeting to celebrate Peter Bodenheimer for his outstanding contributions to Astrophysics: Red Dwarfs and the End of the Main Sequence". Revista Mexicana de Astronomía y Astrofísica (Serie de Conferencias). 22: 46–49. Bibcode:2004RMxAC..22...46A. See Fig. 3. ^ Adams & Laughlin (1997), § III–IV. ^ a b Adams & Laughlin (1997), §IIA and Figure 1. ^ a b Adams & Laughlin (1997), §IIIC. ^ The Future of the Universe, M. Richmond, lecture notes, "Physics 240", Rochester Institute of Technology. Accessed on line July 8, 2008. ^ Adams & Laughlin (1997), §IIIF, Table I. ^ p. 428, A deep focus on NGC 1883, A. L. Tadross, Bulletin of the Astronomical Society of India 33, #4 (December 2005), pp. 421–431, Bibcode: 2005BASI...33..421T. ^ Reading notes, Liliya L. R. Williams, Astrophysics II: Galactic and Extragalactic Astronomy, University of Minnesota, accessed July 20, 2008. ^ Deep Time, David J. Darling, New York: Delacorte Press, 1989, ISBN 978-0-38529-757-8. ^ Adams & Laughlin (1997), §IV-H.
^ Solution, exercise 17, One Universe: At Home in the Cosmos, Neil de Grasse Tyson, Charles Tsun-Chu Liu, and Robert Irion, Washington, D.C.: Joseph Henry Press, 2000. ISBN 0-309-06488-0. ^ Particle emission rates from a black hole: Massless particles from an uncharged, nonrotating hole, Don N. Page, Physical Review D 13 (1976), pp. 198–206. doi:10.1103/PhysRevD.13.198. See in particular equation (27). Since we have assumed a maximum scale of gravitational binding – for instance, superclusters of galaxies – black hole formation eventually comes to an end in our model, with masses of up to 1014M☉ ... the timescale for black holes to radiate away all their energy ranges ... to 10106 years for black holes of up to 1014M☉. ^ Adams & Laughlin (1997), §VD. ^ Adams & Laughlin (1997), §VF3. ^ Caldwell, Robert R.; Kamionkowski, Marc; and Weinberg, Nevin N. (2003). "Phantom energy and cosmic doomsday". arXiv:astro-ph/0302506. Bibcode:2003PhRvL..91g1301C. doi:10.1103/PhysRevLett.91.071301. ^ Bohmadi-Lopez, Mariam; Gonzalez-Diaz, Pedro F.; and Martin-Moruno, Prado (2008). "Worse than a big rip?". arXiv:gr-qc/0612135. Bibcode:2008PhLB..659....1B. doi:10.1016/j.physletb.2007.10.079. ^ Adams & Laughlin (1997), §VE. ^ Carroll, Sean M. and Chen, Jennifer (2004). "Spontaneous Inflation and Origin of the Arrow of Time". arXiv:hep-th/0410270. Bibcode:2004hep.th...10270C. ^ Tegmark, Max (2003) "Parallel Universes". arXiv:astro-ph/0302131. Bibcode:2003SciAm.288e..40T. doi:10.1038/scientificamerican0503-40. ^ Werlang, T., Ribeiro, G. A. P. and Rigolin, Gustavo (2012) "Interplay between quantum phase transitions and the behavior of quantum correlations at finite temperatures". arXiv:1205.1046. Bibcode:2012IJMPB..2745032W. doi:10.1142/S021797921345032X. ^ Xing, Xiu-San (2007) "Spontaneous entropy decrease and its statistical formula". arXiv:0710.4624. Bibcode:2007arXiv0710.4624X. ^ Linde, Andrei (2007) "Sinks in the Landscape, Boltzmann Brains, and the Cosmological Constant Problem". arXiv:hep-th/0611043. Bibcode:2007JCAP...01..022L. doi:10.1088/1475-7516/2007/01/022.